Hmmm....Do You Have a Bigger Size? You’ve seen the movie, Snakes on a Plane? Well, here is something just as scary: Dogs on a Scale! These dogs will do anything to avoid getting weighed. And who could blame them? I get a bit frightened at the numbers I see when I step onto a scale. And, it turned out, my dog Kelly’s vet wasn’t happy with her weigh-in either. So we teamed up, changed our lifestyle, and got fit together. My new book, Dieting with my Dog shares our journey as we learn to love carrots instead of cookies, working out instead of vegging-out. We fit in daily walks, bravely facing off loose, aggressive dogs in the neighborhood. Although it wasn’t easy, we changed our diets, got off our butts and got active. I lost 41 lbs and Kelly lost 6 lbs. And best of all, we did it together. Tanner and Oliver had to take a stab at this scale business after watching the video below. Be sure to watch it; what fun! 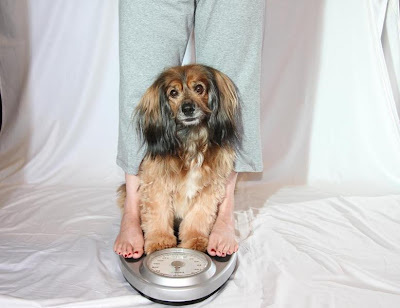 *Studies conducted by the National Association for Pet Obesity Awareness found that more than half the pets in the U.S. are obese or overweight. Winter time in Indiana is the worst because we are not as active as we are any other time. We tend to gain a little weight because we are couch potatoes. Schooner is a little overweight as we go into the winter season. I myself could lose a couple of pound. The book would help us get motivated for the winter instead of gaining weight we can both lose weight and be trim and fit for the spring. I have cut back on Schooner's treats which he is not to happy about and I need to find healthy treats for him. He will not eat carrots. HELP US LOSE WEIGHT THIS WINTER!! Hi Sharon, I hope I can help. One tip I learned from Tasty Tuesday on Kol's Notes is to coat the veggies in some sort of meat--either cook them in some meat broth, or dry some chicken and grind to a powder and sprinkle on top. Hope this helps. Also, try pieces of rice cakes for snacks. I know Kelly still loves to snack too. I like that rice cakes idea. I'll try that! Thank You Peggy I will try that for Schooner. Never thought about rice cakes..I will give it a try. I had to laugh at Shiloh as he tried to fit himself on the small scale. He tried to cooperate, but it didn't work. Finally, he just lay down on the floor with his head on the scale and gave me a sad look, like he thought he hadn't made me happy by not being able to do it. Shiloh is used to big scales. At the vet, when we go to the back, I let go of his leash and he runs to the scale and gets on it without anyone asking him. As soon as he's done, he runs back to his exam room. He's been there so much that he knows the routine. The dogs usually all gain weight during the winter months. It rains all winter and the dogs don't get out much because they dislike the rain and getting their paws wet : ) But in general I have to work on portion control and limiting my treats with them. I have the biggest problem with the Chihuahuas though. They love to eat and even ask for their treats : ) I would love to have some options for healthier, low calorie treats and ways to stay active during the winter months indoors. This goes for me too : )Your book would be a great motivational tool!